My best friend and her husband are massive fans of Ben Aaronovitch‘s books, so I thought I‘ll give them a go as well. Rivers of London is the first book in a series of these detective novels. When I heard detective novels my ears pricked up as I love detective stories, but this one is kind of different. Peter Grant is a trainee police officer. He is very close to his co-worker Lesley. After an unexpected encounter with a ghost, Peter gets recruited by the ‘special branch’ of the Metropolitan Police. There he meets his new mentor Thomas Nightingale. He moves into his mansion where he is teaching him the beginnings of magic or wizardry. When Nightingale gets shot, Peter is left to solve the case by himself. The ghost inhabits different people and uses their bodies to enact a Punch and Julie story. In the end the people he inhabits, die. When the ghosts inhabits his co-worker Leslie’s body things starting to heat up. 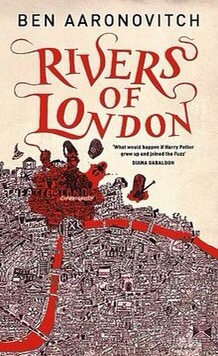 The book is called Rivers of Lonodn as Peter has to ask the different rivers of London for help. The rivers can have a human form and by the end of the book it is also his task to help to make peace between the rivers of the two sides of London. I got the second book as well and will read it, but I am somewhat reluctant about this book. I listened to this book as an audio book and I loved it. Maybe the fact that when a book is read to me, there is time for me to keep up and digest. I later read and liked the other books, too, ( I read some and listened to others) and I wish there were more. The characters were intriguing to me and I liked the setting ( it being a place I have visited but not for decades, living in the US) and how atmospheric it was.